Only 4% of the Universe is made of ordinary matter! Observations of the last few years led to a unified framework referred to as the concordance model. Within this framework, only 4% of the Universe is made of ordinary matter! 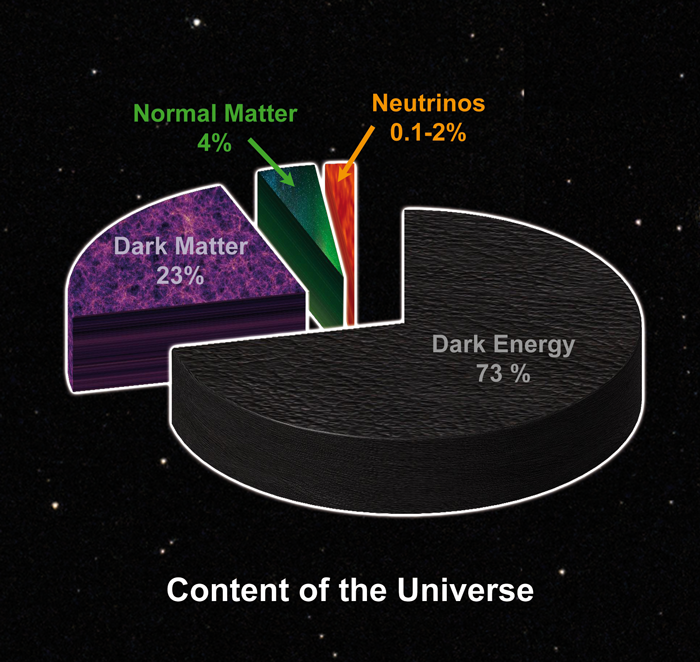 Following the latest measurements and cosmological models, 74% of the cosmic energy budget seems to consist of dark energy and 22% of dark matter. Dark matter turns out to be the main component of cosmic matter. It holds the Universe together through the gravitational force but neither emits nor absorbs light. 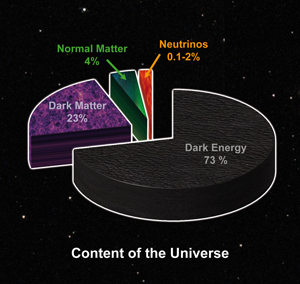 The prevalent view is that Dark Matter (DM) consists of stable relic particles from the Big Bang, and that nearly all of it is in the form of Cold Dark Matter (CDM). In the early Universe, CDM particles typically would have already cooled to non-relativistic velocities when decoupling from the expanding and cooling Universe. Hot Dark Matter (HDM) has been relativistic at the time of decoupling. Neutrinos are typical HDM particles; their contribution to the total matter budget, however, is small. Dark matter has likely played a central role in the formation of large scale structures in the Universe. Its exact nature has yet to be determined. The discovery of new types of particles which may comprise the dark matter would confirm a key element of the Universe as we understand it today. The favoured candidate is a particle which is weakly interacting, similarly to neutrinos, but much heavier than the proton: a WIMP (Weakly Interacting Massive Particle). Such a particle is also suggested by SUper-SYmmetric (SUSY) theories of partice physics. First evidence for dark matter has been obtained from the kinematics of Galaxies as revealed by ground- based optical observations in the first third of the 20th century. Since then, dark matter has become a keystone of the standard cosmology model based on much wider evidence than optical astronomy alone, notably on radio- astronomy. Direct methods look for signals from nuclei kicked on by dark matter particle. Since dark matter is expected to interact rarely and to leave feeble signals, its particles may be first observed in deep underground laboratories, well shielded against noise and ambient radioactivity which may mimic dark matter signals. Alternatively, indirect methods look for signs of annihilation of dark matter particles in celestial high-density regions, like the Sun or the centre of the Galaxy. Products of dark matter annihilation (neutrinos, gamma rays, antiparticles) may be detected by gamma telescopes at ground level or in space, by neutrino telescopes deep underwater or in ice, or by cosmic ray spectrometers in space. 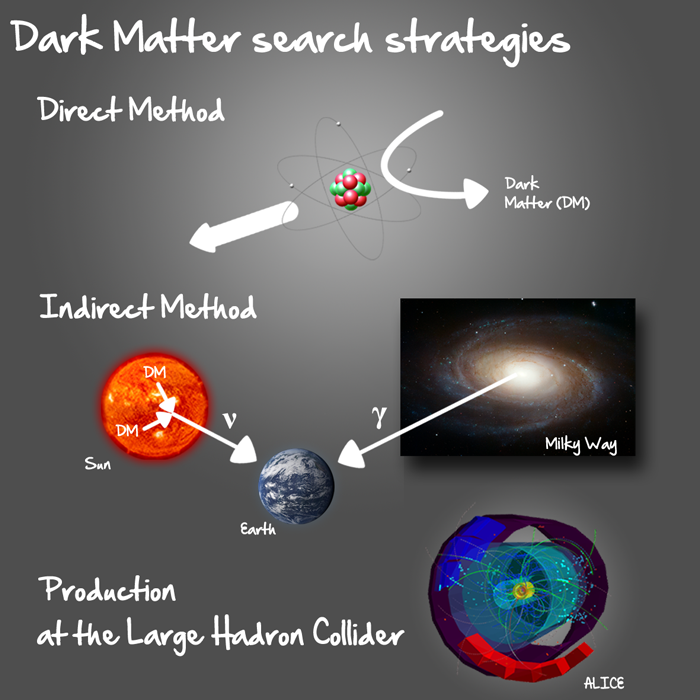 Last but not least, the Large Hadron Collider may also provide first evidences for dark matter candidates through their production in high energy particle interactions. The nature of dark energy remains a mystery, probably intimately connected with the fundamental question of the cosmological constant problem. Dark energy is in the form of an unknown repulsive force, which appears to be accelerating the expansion of the Universe.